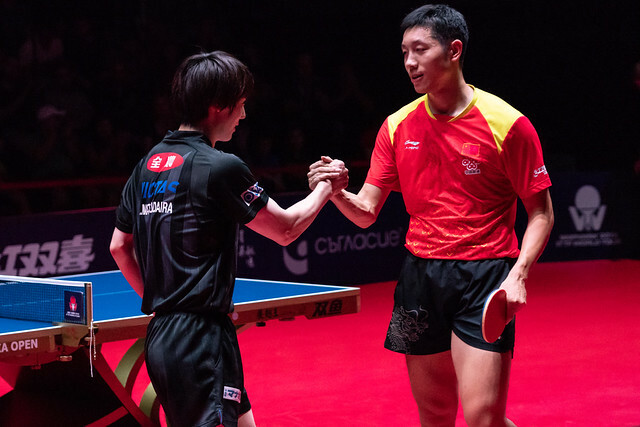 Earlier in the year in June in Kitakyushu, with illustrious names like Timo Boll, Ma Long and Zhang Jike present, Japan’s Tomakazu Harimoto, only 14 years old at the time, had stunned everyone by winning the Men’s Singles title at the Seamaster 2018 ITTF World Tour Lion Japan Open. Now 15 years of age one wondered that, in a field equally as eminent as when playing on home soil, could he repeat the feat at the 2018 ITTF World Tour Asarel Bulgaria Open in Panagyurishte; on the evening of Saturday 18th August, we received the answer. The no.4 seed, he was beaten by colleague Kenta Matsudaira, the no.7 seed, in six games (11-5, 11-6, 9-11, 6-11, 11-7, 11-6). It was success for the player crowned World Junior champion a decade earlier; Kenta Marsudaira had won in Cairo in 2006, ten years later, also in Africa, in 2016 Tomokazu Harimoto had emerged successful in Cape Town. Defeat for Tomokazu Harimoto was news but let us put matters into perspective; if any other player of the same age had reached the same round we would have been applauding a quite remarkable performance. A place in the last four for a young man in his mid-teenage years in a tournament that included the Chinese superstar, Ma Long the reigning Olympic and World champion, in addition to Germany’s Dimitrij Ovtcharov, the current holder of the Liebherr Men’s World Cup title, was no mean performance. However, did Kenta Matsudaira have an advantage? Is there something in the Panagyurishte air that gives him a boost? It is the third time in four years he has reached the Men’s Singles final! Meanwhile in the counterpart all-Chinese semi-final, for Ma Te, a defender if there was one player in the whole wide world he would not want to face it was his colleague, Xu Xin, the destroyer of those who practise the backspin art. True to form, Xu Xin, the no.2 seed prevailed in four straight games (11-9, 11-8, 11-2, 11-8); it was the end of adventures for Ma Te who had started his journey in the qualification tournament. The final will be played on the late afternoon of Sunday 19th August.